A Day in the Life: Why Horses Thrive at EPI – Equine Partners, Inc.
People who drive by and glance over at Equine Partners, Inc., might not realize just how much the equine residents manage to cram into each day. Even on days without lessons or visits from their humans — even on days without farriers, tree trimmers, veterinarians, feed deliveries or compost pick-up — the horses have plenty to do. Here is a typical day’s schedule. Stand in line in the paddock and wait to be haltered. Remove fly mask and put on halter with head down, relaxed and respectful. Walk through the gate, relaxed and respectful. Stand at bucket full of supplements without eating while being tied. Wait to eat until we say “Eat It” and tap the bucket twice. Stand tied for 1 to 2 hours. Stand tied while people, cars, trash trucks, motorcycles, tractors, lawn mowers, bikes, wheelbarrows, and other objects move around. Stand tied while other horses are untied and moved to their paddocks. Look at horse and touch all over to check for any health issues, including bumps, scrapes, lameness or illness. Put on or remove blanket (weather dependent) with head down, relaxed and respectful. Put on a fly mask (weather dependent) with head down, relaxed and respectful. Stand quiet while being untied. Walk to the paddock, relaxed and respectful. Stand quiet with head down, relaxed and respectful, while removing the halter. Stand and eat a cookie respectfully after removing the halter. Horses eat hay and investigate the wheelbarrow and tools while the pen is being cleaned. The person cleaning may give them a good scratch or move them away from their feed. Horses play games and take their early naps. People enter the paddock to do fence repairs, shelter maintenance, inspect mats, etc. Training sessions for horses in starting and development programs. Person comes in to clean the paddock. 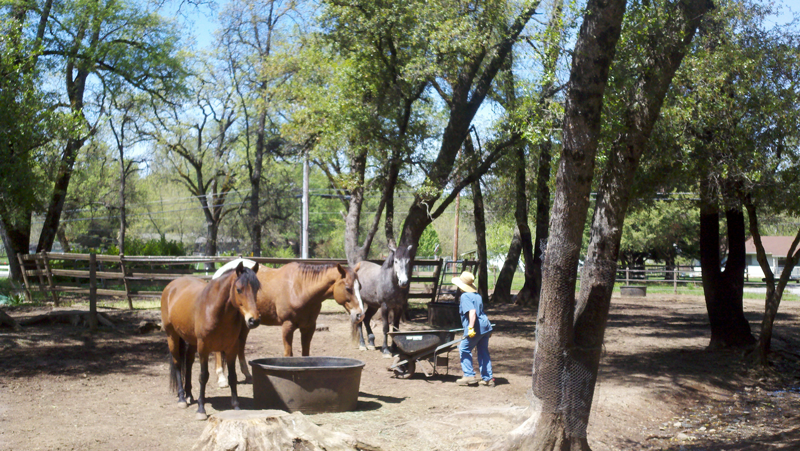 Horses investigate the wheelbarrow and tools while the pen is being cleaned. The person cleaning may give them a good scratch or drive them away depending on the horse’s attitude. Halter with head down, relaxed and respectful. Put on blanket and/or remove fly mask (weather dependent). Remove halter with head down, relaxed and respectful. Horses play games and take their late naps. Horses nap after eating and then the night play begins.